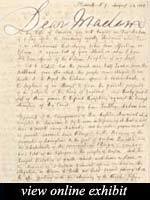 These eighteenth century letters are evidence of an extraordinary correspondence. Here the great historian of England and one of the first historians of the United States exchange their thoughts and ideas. And both individuals just happen to be women. 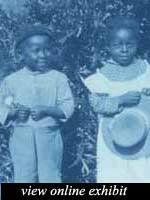 Founded in 1892, the Calhoun Industrial School in Alabama was a freedmen's school devoted to industrial education. 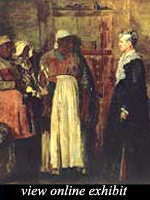 Calhoun was also a social settlement in which blacks and whites lived and worked side by side. The teachers, both black and white, assisted members of the community, especially recently freed African Americans, in gaining self-sufficiency. They believed that education would improve ex-slaves' living conditions. 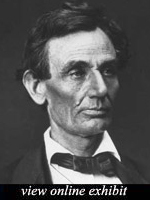 Through the school, they acted upon the words, "Education will prove the equality of the races." Autograph letter signed, dated Rochester, New York, 17 August 1865, to Mary Todd Lincoln. 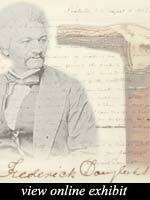 In this letter, Douglass thanks recently widowed Mary Todd Lincoln for her gift of Abraham Lincoln's walking cane. "I assure you, that this inestimable memento of his presidency will be retained in my possession while I live.."
8th New York "German Rifles"
What did the Civil War look like to the soldiers who fought in it? 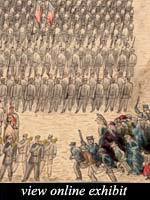 The pictures in this exhibition were drawn by a young Union soldier, Henry Berckhoff, during the war. Berckhoff sketched these pictures in graphite and later added ink and watercolor. He also attached the images to paper boards and bound them together.